An argument over bottles and soda pop resulted in stitches for one man and charges against another. 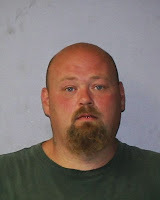 State police say 37-year-old Clyde Young Jr. of Sligo, PA, was arguing with another man in the Chautauqua County Town of Pomfret when Young assaulted the other man, put him in a headlock and obstructed his breathing. The victim suffered a laceration that required three stitches above his eye. Young is charged with criminal obstruction of breathing and is scheduled to appear in Town of Pomfret Court on Tuesday.